Read the article from the Washington Daily News, written by Jonathan Clayborne, News Editor. This article is in pdf format, and will require Acrobat Reader. Thanks to Howard Hoyt for its' conversion, and to Jonathan Clayborne for permission to reprint. For more information, see press release, below. There's an exciting new guild in Beaufort County which combines a love of nature, art, and weaving: the Natural Fibers Group. The group focuses on exploring natural fibers, including collecting responsibly in the field and garden, processing materials, and creating art work. The Natural Fibers Group is associated with the Beaufort County Arts Council in Washington, NC. It is also a North Carolina Basketmakers Association affiliate guild. This new guild is the brainchild of local artist Lynn Hoyt. 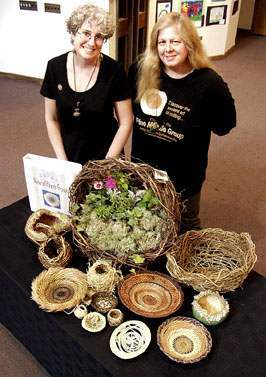 Inspiration for the Natural Fibers Group comes from "The Basket Bunch" guild in Prince George's County, Maryland. Hoyt and her fiber art business partner, Pamela Zimmerman, visited "The Basket Bunch", and were impressed with what they found. An eclectic collection of artists and naturalists, "The Basket Bunch" teach each other, through shared gathering expeditions and group weaves. The communal spirit that embodied the group was spiced with an unmistakable sense of adventure. It was contagious! After visiting Maryland, Hoyt and Zimmerman immediately set out to find some of the magic experienced in their brief visit by exploring their own gardens and woods for new materials and ways to use them. The new Natural Fibers Group explores wild fiber art "from the ground up". Field excursions may include traipsing through woods and field collecting stems, pine needles, roots, grasses, and bark, pulling wild kudzu vines or garden planning and gathering. Each gathering session will include processing the natural materials as necessary to allow them to be worked. Finally, each member will create one-of-a-kind works with the collected materials, utilizing weaving techniques and surface treatments. Zimmerman and Hoyt know from experience that there is fulfillment and beauty in employing primitive methods to make traditional and innovative woven pieces. An award-winning gourd artist and former landscape designer, Hoyt draws on her knowledge of plants and design, and recently taught at the North Carolina Basketmakers' Association annual convention. Zimmerman was designated Beaufort County Art's Councils "Best Beaufort County Artist" in 2003, and has worked with fiber in various applications, including basketry and fabric surface design, over the past 10 years. Both women have won numerous awards for their art. Everyone interested is welcome to join The Natural Fibers Group, including beginners and those from surrounding areas. Fiber artists working in other forms may also want to participate. Yearly dues are $10 to cover costs of a quarterly newsletter. The next meeting is June 14 at 5:30 pm at the Beaufort County Arts Council in Washington, NC. For more information, contact Lynn Hoyt, 252 322-4646, or Pamela Zimmerman.